This is a great course for all ability levels. 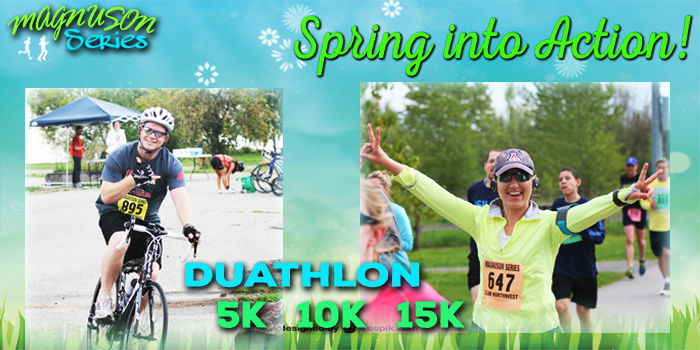 We offer the duathlon race two times a year, check our schedule for the event dates. 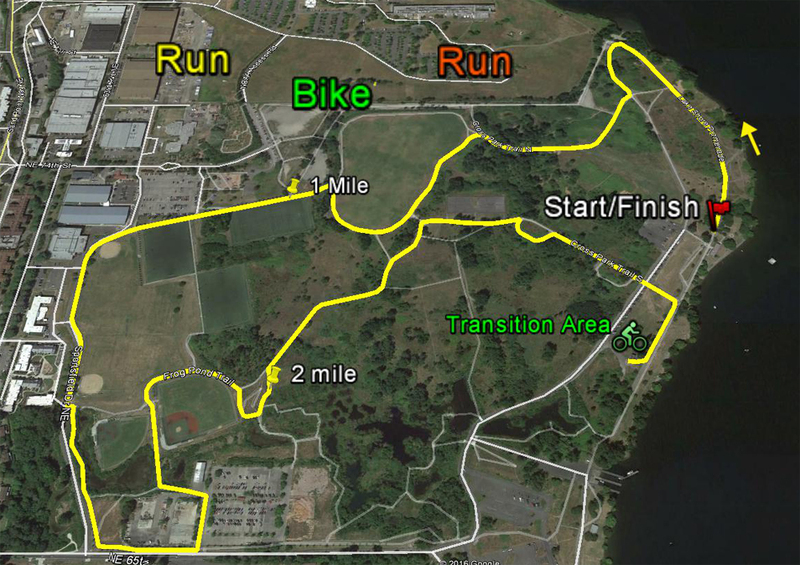 The course starts with a 2.6 mile run that follows the 5k course of the runners. At 2.6 miles you will reach the bike racks and transition area. 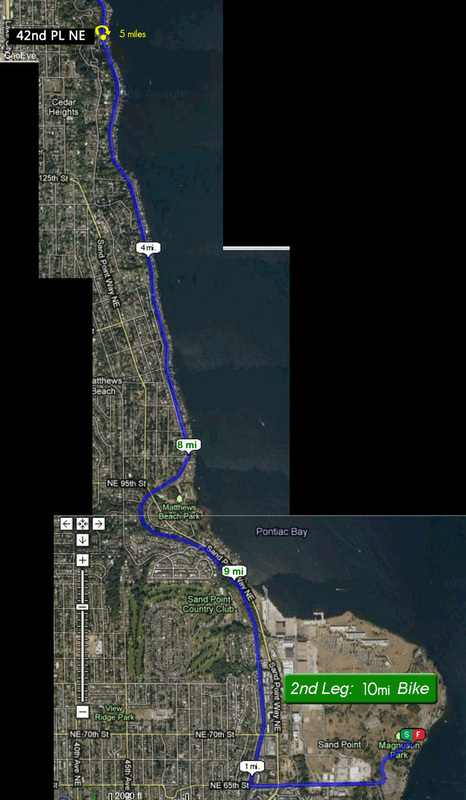 Hop on your bike and head out of the park on 65th St. and then North on the Burke Gilman Trail. The bike turnaround is 5 miles out at NE 42nd PL NE. After the turn around you head back to the transition area for the remaining half mile sprint to the finish. Make sure your bib is visible in the transition area so we can get your split time. A detailed course map is located below. All bicycles need to be racked before 9:45am. The transition area will be open and staffed at 9am so you can leave your bike with our volunteers and get your bib. As you drive in to the park via 65th Ave you will see the bike rack station on your right and can drop your bike off there. We also have bike tags you can put on your bike. The bike rack volunteer has them for you. The transition area has room for you to lay any extra equipment you would like such as bike shoes ect... Riders will need to obey all traffic laws and know that the course is open to the public so please mind other trail users. The Duathlon as well as the 5k, 10k, and 15k will start at 10 am. The start/finish line is the same for all events. If you would like to do the duathlon as a team that is ok. You can have one member do the run and one member do the bike leg, or you can have 3 members do one leg each, however you want to split it up works with us. Each member needs to register individually for the duathlon than send us an email about your team. Have your team members ready at the transition area. 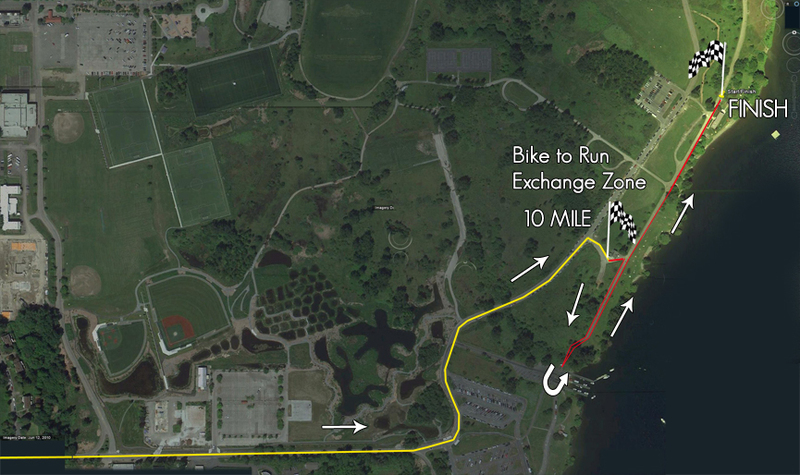 There is only one run course so follow the runners until you reach the bike transition area. 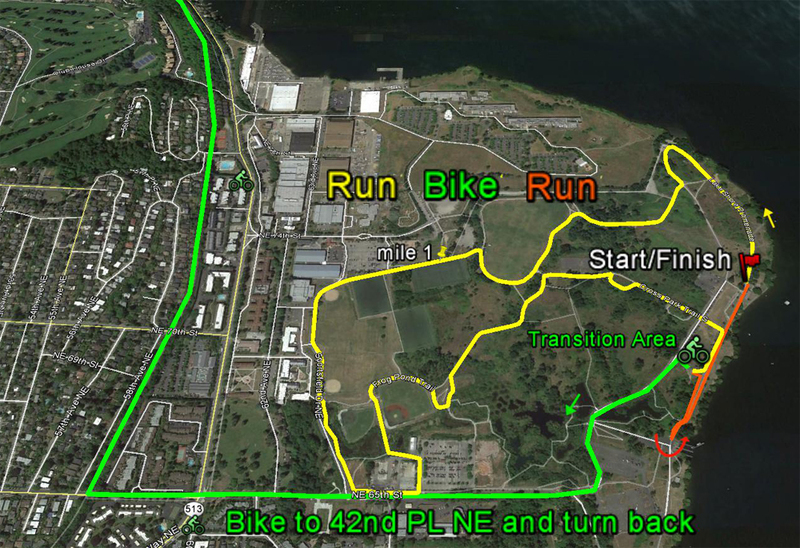 The run is 2.6 miles until you reach the bicycle transition turn off. Upon exiting the park cyclist will come to Sand Point Way and 65th st NE. All participants must wait for a green light, than head up 65th and take a right on the Burke Gilman trail. You head North on the trail until the turn around sign at 42nd PL NE. You than head back to the transition area. Also please be respectful of other trail users as the course is open. Half mile sprint to the finish!